The history of the Tecnomar shipyard is studded with boats with a "breathtaking" performance, equipped with very fast bottoms, and "dressed " in an assertive design that fully expresses their performing style. In recent times the most modern technologies have contributed in a decisive manner to the high-tech characteristics of these boats. estimated cruising speed 34 knots. This is still today the unquestionable "trademark" that Faliero Sarti, owner of the shipyard, desires for Tecnomar although these priorities have now become integrated, particularly in the production of bigger boats, with features such as practical liveability, comfort and luxury, consistent with the selective world of luxury yachts. Bearing witness to this philosophy is the Madras 26, designed in conjunction with the Luca Dini Design Studio. 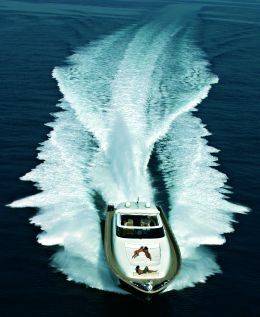 An open developed over two decks, it is built with a composite hull and equipped with chine quickwork with runners. Surface propellers can be adopted on request for the achievement of high speeds. 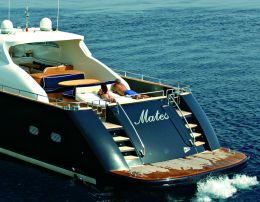 Although spacious, the boat maintains a sporty look because of the generous bow rake and limited deck structure overhung by a hard roof with openable top, leaving lots of space so that full use can be made of the deck. The stern is with transom, with a bathing 'beach' which is fairly wide, although well proportioned in relation to the rest of the hull, accessible from the cockpit by two ladders on the transom. To give the exterior maximum 'conviviality', the cockpit and living areas blend perfectly together on the upper deck, which is entirely surfaced in teak. The Tecnomar shipyard's other principal characteristic is that they offer boats with interiors which can be completely personalised, practically to the point of being a "one-off", in the arrangement of the spaces as well as how each is fitted out. What follows, therefore, is only a rough description of the Madras 26, a standard version which can be altered according to the needs of the individual owner. 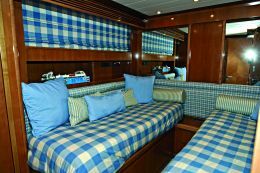 This basic lay-out has a large owner's suite positioned astern on the lower deck, taking up the entire width. Room facilities include a central double bed, "vanity" corner and handy wardrobes and is served by a bathroom, also covering the whole width, equipped with double wash-hand basin and sanitary fittings. 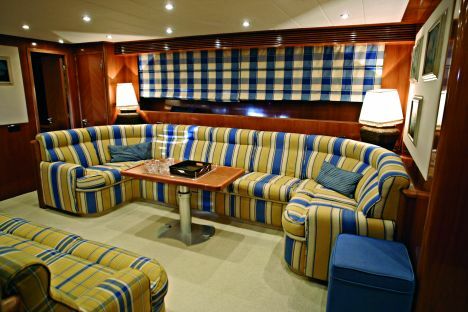 Practically in mid-ship is the large inside lounge which has a spacious dinette with semi-circular sofa facing a second sofa, behind which is the galley. 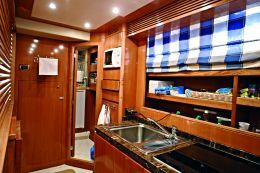 Continuing towards the bow, the Madras 26 has two guest cabins which are practically identical, furnished with twin beds and served by two identical bathrooms. 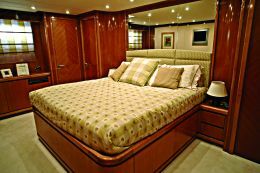 The crew quarters, on the other hand, comprise two beds and a bathroom at the bow, accessible only from the deck to guarantee maximum comfort to the owner and guests. As mentioned, this Madras 26, despite its bulk, is able to reach excellent speeds thanks to powerful motorization. In this case the owner can choose between the installation of 2 Caterpillars of 1,570 HP each or a twin MTU engine totalling 4,000 HP, capable of pushing the boat to the threshold of 40 knots. Even in terms of propulsion one can choose between equipping this Tecnomar with classical shafting line transmission or to assemble 2 Arneson steerable transmissions equipped with 5-bladed propellers.